Set in a fictitious and dystopian version of Earth, The Hunger Games is an annual event where two young people are selected from each of the 12 districts and then pit against each other in a controlled forest battlefield environment where only one person can survive to become a part of the richer world who watch on through a reality TV show. 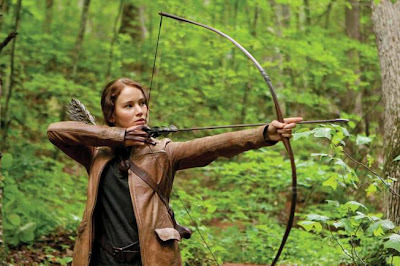 During the participant selection for District 12 when the particularly young Primrose Everdeen (Willow Shields) is selected as the female candidate, older sister and expert archer Katniss Everdeen (Jennifer Lawrence) volunteers herself in her sister's place, and is sent off into a fight for survival with the district's male candidate, Peeta Mellark (Josh Hutcherson). 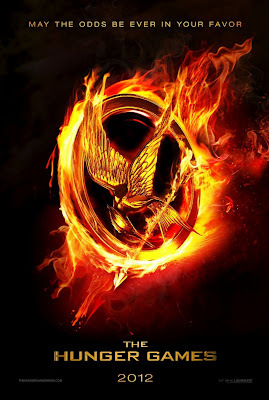 Adapted from the original book (the first in a trilogy) by Suzanne Collins, and brought to the big screen labelled as 'the next twilight,' The Hunger Games actually provides much more for a much larger audience than you would initially expect from what appears to be a film aimed at a teenage girl demographic. Whilst the film is rated a 12A here in the UK (down from a 15 certificate after the cutting of seven seconds of footage and the digital removal of blood splatter), the film is very dark and mature from the very start; when we are introduced to the character of Katniss in the poverty filled District 12 as she hunts animals in the wood for food. Once the film enters the battle arena after a whole host of training sequences and Olympic style proceedings from the TV show, the events suddenly turn very brutal, with violent killings of and by youths as they literally fight for survival. This is something that I in particular didn't expect to see coming so vividly, meaning that it's certainly not appropriate for some younger viewers and perhaps even some of the older ones either - you have been warned! However whilst I give caution to this, I do at the same time feel that this is actually the film's strong suit too, giving the film a lot more weight and credibility for making it a much darker affair, with a much greater reward for the audience - it simply wouldn't have worked with a lighter family orientated tone. The film's acting cast, lead by Jennifer Lawrence, is fantastic and work well to bring this world to life. Lawrence in particular does a fantastic job of portraying a very strong female lead character, who is tough yet lovable and upon whom the entire film rides upon and works as a result of - seeing a film with such a female lead character like this was a breath of fresh air to see. Despite this I did feel as if her love relationship with Peeta did weaken her character slightly, with their whole love story becoming cliched and unneeded, pushing the film further towards the anticipated teenage girl demographic; however the twist and questioning of just how genuine their relationship is within the reality show setting did give it a bit more power and weight, helping to justify it a bit more. Aside from that little quip, the film on the whole features a gripping and exciting character driven plot, directed excellently by Gary Ross who creates a visceral world that keeps you enticed and never bored throughout. Whilst it's an not entirely unique story, it certainly is one that hasn't been done like this before or used recently, making it a cinematic treat that you may not have seen coming - if you ignored all of the initial hype generated by the fans of the original books, you better start believing it! People keep saying that this could be the next big thing in film after the recent Harry Potter and Twilight franchises - I think they may be onto something. Whilst the trailer didn't fill me with much hope, this dark and exciting film definitely isn't the new 'Twilight' teenage girl targeting film that you may go in expecting - it is much, much more. Suitable for a large teen and adult audience of both genders; with bold action, an enticing story and a great cast lead fantastically by Jenifer Lawrence, The Hunger Games certainly isn't one to overlook. The Hunger Games is still showing in cinemas across the UK.